In soccer Germany had an issue with good players for the A national team and used a lot of U21 players at age of 18, even for unimportant test games and these players missed the respective European championship. Germany never got a title in this time. They even did it lately and we missed the Olympic qualification with the U21 team for London. Before that we won all European titles for the U17, U19 and U21. Did our national team win any title despite of using those very good and young players? No! Messing up with these things is pretty bad for the development of players! It's a little fracture in his foot, no big deal. It's not like he's playing with a soft tissue injury. It might be sore, but there isn't any long-term danger. Lots of players get these and don't even know they have them other than some throbbing in their foot. Common. Meh. It doesn't matter if they would or not, it's about giving him the opportunity to have done so. "Oh Canada lost anyway so he shouldn't have gone" is a terrible line of reasoning. Monahan probably would have been a difference maker though. Was another goal against Russia or an early one against the Finns? Who knows. Doesn't matter. Wow you guys. Who cares???? He is scoring goals for the Flames. It appears he may be mending a bit as he is now getting points again and taking shifts on the better lines than the 4th line. There is still no reason to believe he would have made a difference on WJr Team in his beatup condition. All the team doctors and rehab people are here. The fallout is continuing in WJr / Hockey Canada lands for this loss. Butter complaining the Jr's aren't trained as well as they used to be and it is a developing thing from lesser leagues. Fans complaining about maybe Butters play to not lose style is dinosaur age coaching.... Hockey Canada and politics in the selection process. 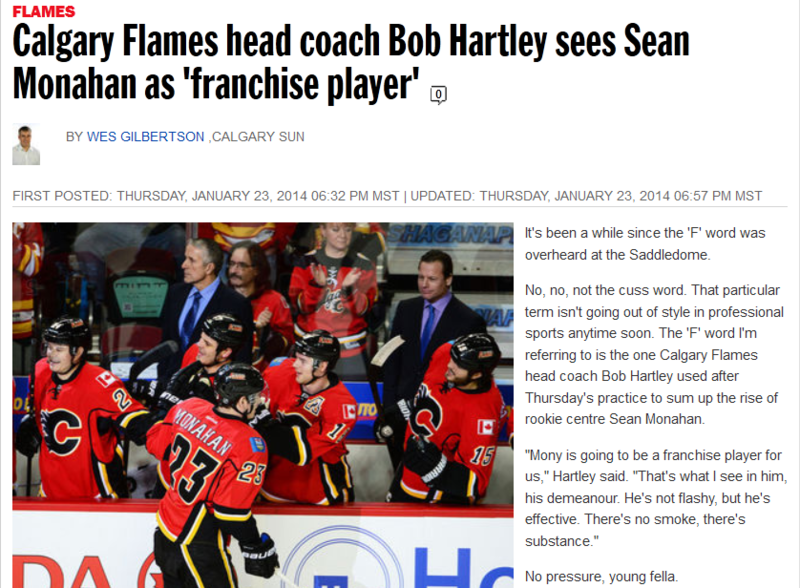 I am kind of glad now that Monahan was right here through this years "World Junior Experience". I just think the rest of the world is catching up to us. The AHL certainly wasn't up to Swiss league standards at Spengler this year. In 2009 the ZSC Lions beat the Blackhawks (now, I don't claim that this would have happened over a 3 or 5 game series, but...). There is alot more parity in the world of hockey. I don't think a gold or even a medal is a certain thing anymore. The Swedes, Finns, Russians, and even Americans are as good as us when you can just select 20 odd players. Now if you're making a league, obviously Canada has depth. But in a pick your best format, our depth is worthless. Monahan has scored all of the Flames goals in the last 4+ games. At first glance, this statement sounds so powerful, like, league MVP stuff right there... I mean when has a player scored all of a team's goal over a 4 games span? Yet, it's not because of dominance but rather, it's because the Flames have been shutout in consecutive games. It's kind of like, Jiri Hudler is the Flames leading points man but he can't cut it on the 4th line for Detroit Red Wings, at least, not at his salary. Plus, he's not good enough for his national team. Hudler was on Detroit's 2nd line and the only reason they didn't sign him was because of the raise he was looking for. He was said to have had an argument with his national team's head coach why he was not selected. If they were picking the best of the best, this wouldn't even be an issue. From what I read, they wanted the picks scattered from all the junior leagues in Canada. Kind of pointless to me. That would be like Stevie Y picking one Canadian player from all 30 teams in the NHL for the olympics. Pick the best guys and who cares what league they play in. I believe our depth is there, and we have the players who can compete for gold every year. The problem is the management team being made up of politically correct morons. Okay, Monahan is third in goals among all NHL rookies and Hudler is in the top 40 in scoring despite being on the second lowest scoring team in the league. I thought coach Tortorella was coming into our dressing room to say hi but he wasn't. Funny, but too bad it's a mock account. 7k+ followers though, thats impressive. Pretty sure i got his twitter from the Fan960 feed. ^ The fan isn't always right with their sources, and alot of times they play tongue in cheek content. It's a mock account. Albiet a good one. 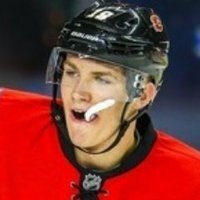 https://twitter.com/Monahan20 is his real twitter. It also has double the followers and it's the one he's used since being drafted. Wow, no pressure is right. Feaster was guilty of saying such things about Sven, and some other prospects, dishing out the over-hype. Keep it simple and let the kid play his game. From a defensive standpoint, Monahan looks like a keeper. He back checks hard and reads the plays well. His size helps him contain opponents. I think positionally speaking, he's going to be great in the future. Offensively though, he's going to have to score all his goals from within 6 feet of the net because he has NOT shown any slap shot abilities, perimeter shooting abilities, no quick release, no extraordinary stick handling abilities, no exceptional passing abilities, no gifted play making abilities, and no blazing speed. Everything seems kind of average from an offensive view. His strengths are focused around out sizing defenders for position in front of goalies, screening goalies, and making deflections. In other words, it's VERY difficult to see Monahan score 30-goals consistently in the NHL. In comparison, when someone like Nathan Mackinnon shoots the puck, they are zingers. Like similar to Jeff Carter, Kovalchuk, etc. When someone like Jon Drouin carries the puck up ice, he is elusive like Patrick Kane. I guess it's fine. He can still be a big minutes guy playing a solid two-way game and scoring 65-points a year. 65 points a season and playing a solid two way game would make him an upper echelon center in this league so I would be very happy with that. I don't think we have seen Monahan's full arsenal of skills yet. He still seems very tentative out there and is really keeping his game simple. I think next year you see him come out bigger, faster, stronger and more confident. He is a player to build a team around, not a one-man scoring machine. A big center will be the focal point for the other teams, since we have no other star players on him line. When he gets the puck, 2 guys are on him. If we had a secondary threat on his line, there would be more space for him. I think that's a bit unfair Peeps. He may not have a rocket but he can pick his spots quite well and if he was put in that position to on the Pp I think he would. His shot accuracy is very good IMO and so I see him having more tools then you suggest at this point. I don't think you too far off with your numbers though I saw him as a 70 ish point guy at his peak because I do think he'll her better as has more vision and passing ability then he had shown. He's shown flashes of it but just need more consistency which comes in time. 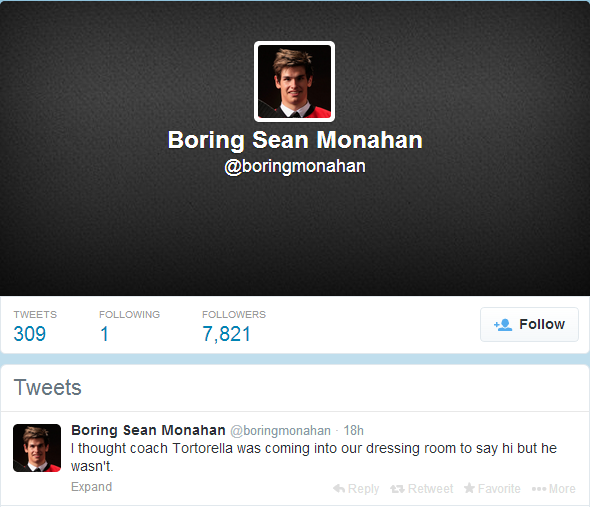 I don't know what we have in Monahan yet. I am ready to declare he will be an NHL player. I am not ready to say he will be a franchise player. But so far so good. I don't have any issues with his offense. He may not be fancy, but he is smart and gets in the right position. He is on a 25 goal pace. That is really really good for a rookie. Let alone a rookie in his +1 draft year. I am more concerned about his defensive ability actually. He still struggles in the d-zone many games. Not a big issue as that is expected for a rookie. But I think defensive play is a bigger flag than offensive play. That all said, 65 point C aren't exactly common. Guys that put up more than 65 points consistently are exceptionally rare. If Monahan can put up around 65 points a season and be a strong defensive C that is a huge win. It was nice to see him try something different in the shootout tonight. Keeping it fresh. I agree, he did really well! Telling a kid he's a franchise player is a helluva lot of pressure. Although he was a -3 tonight because of Nystrom's liitle show, he responded well in the shootout, and after that comment from Hartley. We'll have to see how he progresses over the remainder of the season. However, Monahan doesn't strike me as a kid with confidence issues. He's been pretty steady all year. I second this motion. Hudler is better than Tangs as a play maker also. He is no 4th liner. I like Mohanan but I hope he doesn't get over pressured like Sven was. I also think he has more skill than "people" give him credit for.